Pimento Cheese (pimento is pronounced puh-MIN-uh, by the way wink wink) is an iconic Southern food that's been around for over a hundred years, but my Southern grandmother never mentioned it; I had to learn it on my own! 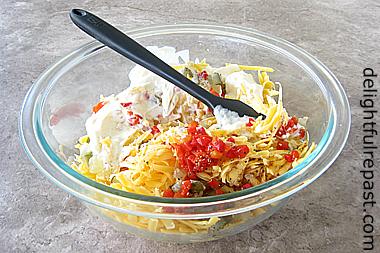 There are many variations, but it's basically shredded sharp or medium Cheddar, mayonnaise and pimientos. Delicious on a hamburger, hot dog or bacon sandwich, it's more often just slapped on some soft white bread for a quick sandwich, cold or toasted. Apparently, you can also stuff celery with it, spread it on crackers or dip tortilla chips in it. But I only ever seem to serve it with crudités or in tea sandwiches. It "must" be made with real mayonnaise. Many Southern cooks swear by Duke’s mayonnaise, but I have to make do with Hellmann’s/ Best Foods or my Homemade Mayonnaise. Duke's is still made in Greenville, South Carolina, and sold throughout the South. Sticklers for authenticity can always do mail order! Purists may not add anything to the basic ingredients, but I can't resist a little dill pickle and dill pickle juice along with black pepper and a pinch of cayenne. You can add a few chopped green olives, red wine vinegar, Tabasco or Worcestershire sauce, so I might have to give that a try in the next batch. Some like it blended smooth, but I'm among those who prefer it a little chunky. Does your family have a pimento cheese tradition? Would you like to start one? I’d love to hear your thoughts on pimento cheese. 1 In a 2- to 2.5-quart mixing bowl, stir together all ingredients until well blended. Leave it a little chunky, as I do, or use an immersion blender to make it as smooth as you like. Transfer to serving bowl and cover. Chill for a few hours or up to one week. 2 Serve with a crudités platter, crackers, tortillas chips or bread. Spread on hamburgers, hot dogs or bacon sandwiches. Use it to make a cold or toasted cheese sandwich or, as I have here, tea sandwiches. Hi Jean! I've never had pimento cheese sandwiches, dip, or anything else but it does sound good. I love cheese! A dip with a veggie tray really appeals to me. With more family around for Christmas this year, this might be something I could serve. Thanks for sharing. What? No “t” in pimento (pimiento). How can you not pronounce the “t”? I thought you were big into tea everything. I’m a sucker for buying exotic cheeses. Put something sweet or fiery into a cheese, call it Red Dragon or whatever and say it’s on sale at $19.9999999/lb and I stock up. Dunno why. It all tastes pretty much the same to me. Like cheese, ya know? Ah, me, no matter…I’m just talkin’ to hear my teeth cheddar. My parents love pimento. I've enjoyed pimento sandwiches, but have never tried it with burgers, hot dogs or veggies. Thanks for the visit, Jean. I've been off the grid for a long while but it's nice to pop in here today. Now pass me a tea sandwich...pretty please. Thanks, Sandi, it will be interesting to see how it goes over with your family at the holidays! Sully, sounds like you're a prime candidate for pimento cheese! Give it a try and let me know! Thanks, Margie. Sounds like you should whip up a batch for your parents! Grace, well, he's not wrong -- just the cheese and mayo is pretty tasty, too! Martha, I love things that remind us all of our crazy aunts! :-) My husband is very fond of green olives, so he would probably like this even more with olives. But, like you, I'll skip the olives in my PC. Ellen, yes, you've been off the grid, but you've had a lot going on! Thanks for stopping by. 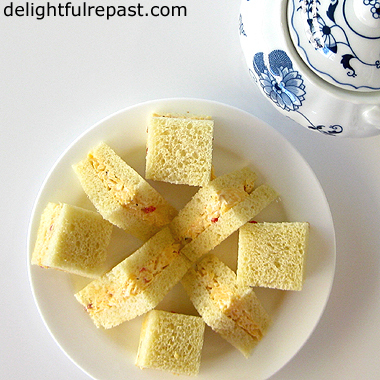 Wish I could take a plate of tea sandwiches over and tour the new place! I never understood the “Southern” reference to pimento cheese. It was a picnic staple in our house dating back to the 1940s and my parents never set foot below the Mason/Dixon line. Pennsylvanians all the way. Ours was made with the sharpest cheddar you could find (New York Sharp), sweet pickles with a bit of juice, hard boiled eggs, and pimentos all ground up with a clamp on the table hand grinder. The mayonnaise was mixed with equal parts vinegar and a bit of sugar, salt and pepper,and warmed so that when it was poured over the cheese mixture it helped to blend it all together. It wasn’t exactly smooth or chunky, just right. I never questioned the origin of the recipe and now there is no one to ask. When I moved to Florida, I couldn’t wait to try Dukes....hated it and ended up throwing it away. Had a weird off taste. But then I can’t eat cilantro either. This is my favorite comfort food of all time. If you liked it, you knew the right proportions and could tell by sight if the ingredients were balanced. I never saw a written version. I like it on a freshly baked sandwich bun with a thin slice of tomato, onion and lettuce or in a toasted bread sandwich. I have tried it as a dip or cracker spread but not the best option for me. Nancy, one source I read said that pimento cheese actually got its start up North, in New York! But I guess it went over so big in the South that it's come to be associated with the South. I'll have to try Duke's someday and see if it lives up to the hype! (I do love cilantro, but I'm told it tastes off, even soapy, to some people.) I like the sound of "on a freshly baked sandwich bun with a thin slice of tomato!" Oh, how I love pimiento cheese! We used to buy horrid jars of it when I was a kid, and I loved it. It wasn’t until about 10 years ago that my sister-in-law (a true southern belle) made it for me from scratch. What a difference. I look forward to asking your recipe and having some lovely tea sandwiches! I do love a good pimento cheese sandwich, Jean, and yes, stuffed into the cavity of celery stalks. Thanks for sharing your version. I have bought Duke's mayo, as it can be found in some grocery stores here in Texas. Happy weekend to you! Thanks, Angie. Maybe you could try them at one of your tea socials at work! David, thank you. I hope you like them! The pimento cheese is also great on quesadillas, by itself or with chicken. Judy, I thought anything my grandma fed me was the most delicious thing ever! I'd love to have some home-canned raspberry sauce on hand. And even though I call the process "canning," I would probably call the sauce "jarred." (In Utah, they--at least people I knew--say "bottled," as in "We bottled pears yesterday." Thanks, Kitty. I'll have to try it in the celery for my husband; he grew up with stuffed celery. And I might one day have to break out of my pattern and try some Duke's mayonnaise! Really a classic, isn't it? A Southern fav tea sandwich. Perfect! Thanks for linking to Tuesday Cuppa Tea! Thank you, Ruth. Love #TuesdayCuppaTea! 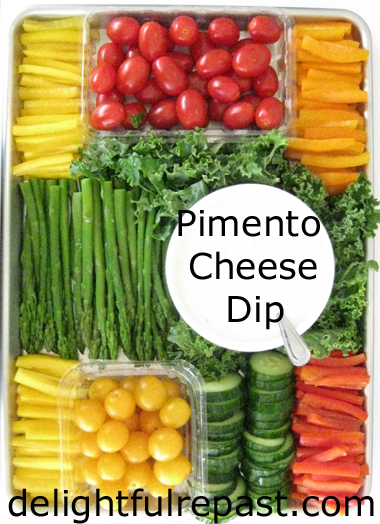 I don't know about pimiento cheese--my brain taste buds say everything but the pimento sounds good. Perhaps it's because I'm a Northwest Northerner. My mother, 'a 5th generation Washingtonian (DC)' loved to make Chicken a la King. I never liked it....I didn't like the pimentos. I may have to try the recipe without them. Love cheddar, dill pickles, hard boiled eggs. Cheers! Go for it, Sue! You can call it Pimentoless Cheese! This recipe sounds delicious! I'm definitely going to try it...Thank you for sharing at Party In Your PJs! Thanks, Ann! I hope you like it as much as we do! My mom is making some sort of pimento cheese for our monthly birthday celebration this Sunday. I'll have to compare her recipe with yours. This is the stuff that made me shudder as a child. Perhaps I need to get over my childish ways and give it another chance. It sounds perfectly delicious to me now. Having never had Duke’s, I am a Hellman’s gal. Cheryl, do please let me know how the two recipes compare. I haven't had Pimento Cheese in years, Jean! I do love it, and I'm so glad you shared your take on this classic. I can't wait to make it again soon! Sharing, including on the Hearth and Soul Facebook page later today. Thank you for sharing, and for being a part of the Hearth and Soul Link Party. Hope you are having a great weekend! April, thank you so much. AND for the social media shares - much appreciated. Love the #HearthAndSoul! Now I could most definitely eat that at any time. I had no idea that this combination was a thing let alone a classic. I suppose the closest we get to it in England is potted cheese using butter (and sometimes sour cream) rather than mayo and flavoured with mustard. Phil, you're right - I forgot all about potted cheese! But the potted cheese is a smooth paste, and pimento cheese can be quite smooth but usually has a bit of texture. But butter, cheese and mustard -- can't go wrong there! We are Pimento Cheese Fans and your recipe looks delicious, wish I had a bowl of it for a sandwich right now! 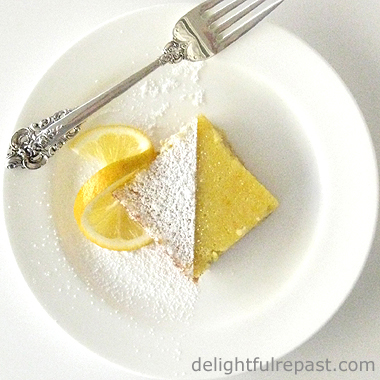 Thanks so much for sharing with us at Full Plate Thursday and have a great week! Miz Helen, thank you so much. Hope you're having a great week. I LOVE this stuff! I always use extra cayenne pepper in mine, 'cause I love spicy. And although this is most excellent on a sandwich (or as a burger topping), I probably eat it as a dip most of the time. Or by the spoonful. :-) Fun post -- thanks. Thanks, John! I eat it by the spoonful, too! I love pimento cheese and remember making it from scratch as a girl for Sunday night church suppers for the youth. I enjoy using different types of cheese. Although cheddar is my favorite, I love almost every cheese I have ever tasted. Thanks for visiting my blog, I plan to put a link for yours on my list of blogs I read. Thanks, Lulu. It's great connecting online again! I'm with you - I love all kinds of cheeses! It really does sound wonderful! Thanks for sharing it with SYC. 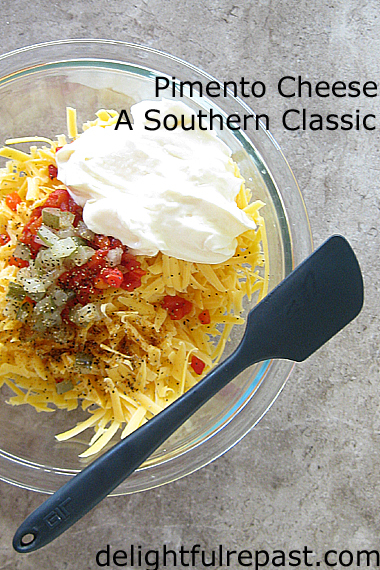 Jean, I love pimento cheese and it is a true Southern favorite! Every Southern girl should have a tried and true recipe for pimento cheese. Thank you for sharing yours. Can you believe my hubby doesn’t care for pimento cheese? I've never heard of this kind of cheese but it sounds yummy to me! Thank you for sharing this with us at #TriumphantTales. I hope to see you back next week. Jann, thank you. Love SYC! Pam, thank you. Be sure to have him try a bite every year or two. Tastes change. One day he'll try it and say "Where have you been all my life, PC?!" And try him out on different textures--as you can see, my cheese is very coarsely grated, but some people like it blended smooth. Lianne, thank you. I think the closest thing you have to it in England is potted cheese, but they're really quite different things. Thank you, Lucy. I think the closest thing you have to it in the UK is potted cheese, but they're entirely different. Potted cheese is smooth, pimento cheese is often chunkier. Potted cheese has butter, pimento cheese has mayonnaise. You should make a batch for him and let me know how he liked it!